In an attempt to ruin Christmas, Scrooge has kidnapped Rudolph the Red-Nosed Reindeer and Santa's helpers, as well as stolen the Christmas presents meant for the little boys and girls around the world. To save Christmas, Santa must rescue Rudolph and his helpers and also retrieve all the stolen presents. - Keep Santa Claus safe by landing him on the cages or boxes. To complete a level all NON Rudolph cages must be removed. If Santa Claus lands on the ground he will be captured by Scrooge. - Get Santa Claus to land on Rudolph's cage. 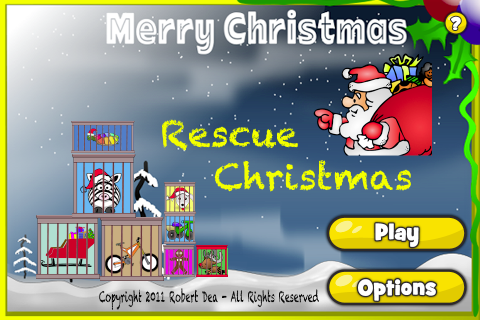 - Click on the cages/boxes to get back the Christmas presents. - Make sure all cages/boxes are removed to go to the next level.